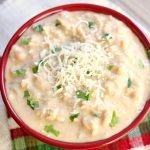 Instant Pot Creamy White Chicken Chili–an indulgent white chili recipe with green chiles, onion, chicken breasts, and white beans (dried or canned). Win your next chili cook-off with this recipe. I have 6 sisters. Sometimes my mom and sisters get texting and a lot of the time it’s about food. Food we are trying and food we like. Food food food. Someone mentioned they made a white chicken chili recipe for a work party and won the chili cook-off. I, of course, asked which recipe she had used and she pointed me to a white chicken chili recipe that’s made on the stove top. I read through the recipe and knew that it would make a perfect candidate for an Instant Pot recipe. I ended up using dried beans for this recipe but you can also use canned white beans. The original recipe included 1 1/2 cups of cheese in the soup but I felt that was a little overkill. It’s fine with just a little cheese sprinkled on top. I also felt that it was lacking acidity and something needed to bite through the creaminess. That’s why I added the lime juice. 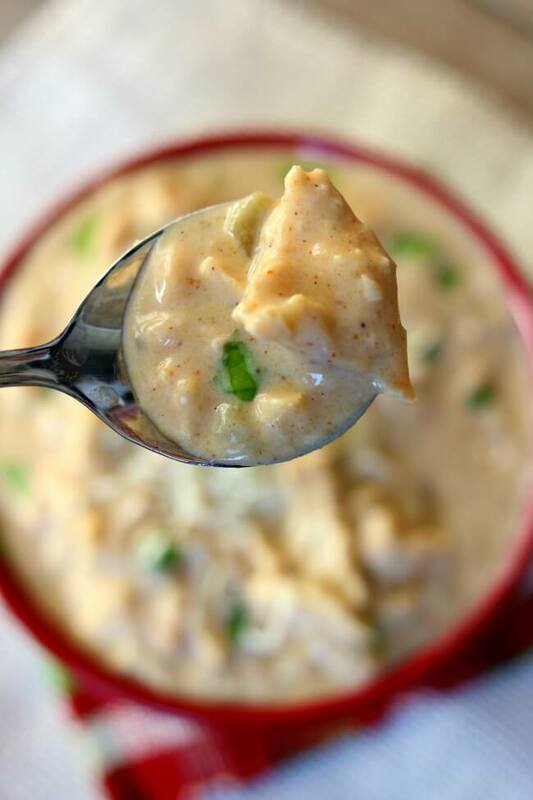 I think you’ll love this instant pot creamy white chicken chili recipe. It’s not something I would make every day because it’s quite indulgent–butter and sour cream and cheese. But it’s seriously so good. To make instant pot creamy white chicken chili I used my 6 quart Instant Pot Duo 60 7 in 1*. I love this Instant Pot because it has the yogurt making function which I use almost weekly. It has two pressure settings (high and low), and there are also little slots in the handles so that you can rest the lid there instead of putting it down on your counter-top. An indulgent white chili recipe with green chiles, onion, chicken breasts, and white beans (dried or canned). Win your next chili cook-off with this recipe. If using dried beans soak them overnight in water and 1 tsp of salt or perform the quick soak method. You can do this by placing the beans in the Instant Pot and covering with water and sprinkling in 1 tsp of salt. Bring the water to a boil using the saute setting (lid off). Once the water boils turn off the saute setting and put the lid on the pot. Make sure valve is on sealing. Set the manual or pressure cook button to 2 minutes. When the 2 minutes is up perform a quick release. Use a colander to drain the beans and rinse them off. You can now use your “soaked” beans. Turn your Instant Pot to the saute setting. When the display says HOT add in the olive oil. Add in the onions. Saute for about 3 minutes. Add in the garlic and saute for 30 seconds. Turn off the saute setting. Add in the chicken, canned beans or soaked dried beans, chicken broth (2 cups for canned beans and 4 cups for dried beans), chili powder, cumin, pepper, 2 tsp salt and green chiles. Stir. Cover the Instant Pot and secure the lid. Make sure valve is set to sealing. Set the manual button or pressure cook button to 20 minutes. When the timer beeps indicating the 20 minutes is up, let the pot sit there for another 10-15 minutes. Then move the valve to venting and release any remaining pressure. Remove the chicken and place on a cutting board. Shred it and return it to the pot. Melt the butter and use a whisk to stir the flour into the butter until it’s creamy and smooth. Turn the Instant Pot to the saute function and stir in the butter flour mixture. Let the flour mixture thicken the soup. Stir every minute or so. This will take about 5 minutes. Stir in the milk, sour cream and lime juice. Salt and pepper to taste. Ladle into bowls and sprinkle with Monterey jack cheese and cilantro. Enjoy! Karen, bravo! What a great idea! Love this. I’m sure this is incredibly delicious! I made this for a chili cook off and took 1st place! Awesome chili, thank you for the recipe! NICE!!! So happy for you. You’re welcome Patricia! So glad you enjoyed it. I followed the recipe almost exactly except added one can of whole kernel corn and one can of chili ready tomatoes. Used dried beans and canned chicken. I only used half the butter, flour and milk and it turned out DE-Licious. Beans are tender. Def make again. I just love all your recipes! This would be fine for probably up to 4 hours. This is not about the recipe….just about you and what you do. Love the recipes and commentaries…love your responsiveness. Awesome all around!!! Thanks Jeanne! You’re so nice! This soup is so delicious and worked beautifully in the Instant Pot! The only change I made was to use half the butter and flour. It still turned out to be thick enough and very rich and tasty! My husband really liked it too, and it has become our new favorite soup! I will definitely be making this again!! This was very tasty! I used yogurt in place of the sour cream and, instead of the roux. I melted in 2 T of butter for added flavor and thickened with 5 T of cornstarch mixed with water. The lime juice added a nice layer of flavor, and we topped the chili with a sprinkle of grated pepper jack cheese for a little extra heat. I would like to make this recipe but use ground chicken breast. What should I adjust to make it this way? This was really good! I basically made the recipe as written, except I used Smoked Ancho Chili powder instead of regular chili powder, which added some nice depth of flavor. And I found I didn’t need all the milk as we like it thick. Served it with good old Jiffy cornbread! Wow that sounds really delicious! This was my first time using a pressure cooker. I did quick soak on dry beans but they were still a little firm when I served them. Not sure what I did wrong. If you have old beans, you need to “soak” them longer. My beans were from a large bag that I opened several weeks ago. I just “soaked” them for 7 minutes instead of 2. They turned out great! Love this recipe! I used the quick soak method for dry beans and used frozen chicken breasts and thighs – turned out perfect using the cooking times described in the recipe. I added some cayenne at the finish because I wanted a little more heat. Great recipe! I’m gonna save it. Definitely a 5-star recipe! My family & I LOVED this! Sharing this recipe with my sister who just got her first Instant Pot. My family loved this recipe. Tweaked it by using plain yogurt in lieu of sour cream. Also used skim milk and it came out delicious!! I made this with the “dry roux” and omitted all the dairy. Delicious! I made this so I could start using my instant pot more, plus I didn’t have time to use the crock pot. Instead of the spices listed, I used a packet of McCormick’s white chicken chili. Everything else I kept the same. My whole family loved it and it is for sure a keeper. Which white bean are you referring to in this recipe? There are lots of them. you can use navy beans or great northern beans. If I soak the dried beans overnight do I still use the 4 cups of broth??? Just want to be sure and not make a mistake!!! Left out flour, butter, milk mixture and left out sour cream – wanted mine more broth-like. I did take an extra can of white beans and puréed half of beans in food processor and added to soup. Doubled the recipe (used canned beans) – wonderful flavor!! Will make this a lot this winter!!! Loved the chili, but I don’t get the same nutrition info. I have tried several apps including Happy Forks and Calorie Counter. Where did you get the nutrition info from? The my fitness pal. How does our info differ? I’d love to know! Hi Annette, I’m glad you liked it! I just updated the recipe with the nutritional info. I made this last night following your recipe and my family loved it. I’ve seen a few other people make suggestions for alternatives to the traditional roux, to eliminate the butter and flour and was thinking of using additional beans in a slurry to thicken it next time. Have you ever tried this? I personally haven’t but I’ve heard others have good success with it! So happy to hear this Amy! This is a good recipe, but as it’s my only and first time making White Chicken Chili, I have none to compare it to. I used the dried beans and the presoak method, which needed 25 minutes, and not two. It was also too thick, so I had to add 3 more cups of broth; and not spicy enough for my taste, so added some diced up pickled jalapenos, and a can of Rotel. Then I had enough to share with three neighbors! It was tasty, and I will make it again. This was so delicious! Just the right amount of spice for my family. Mine also turned a bit darker color- I think it is due to the amount/color of the chili powder. It was not unpleasant- just not white. Also, I will try to make this lighter in calories next time. It is really thick, so I’ll be reducing the butter/flour. I used 2 large frozen chicken breasts and it came out just fine. That is the beauty of the Instant Pot! Thanks for the recipe! It turned out absolutely delicious! I love it! 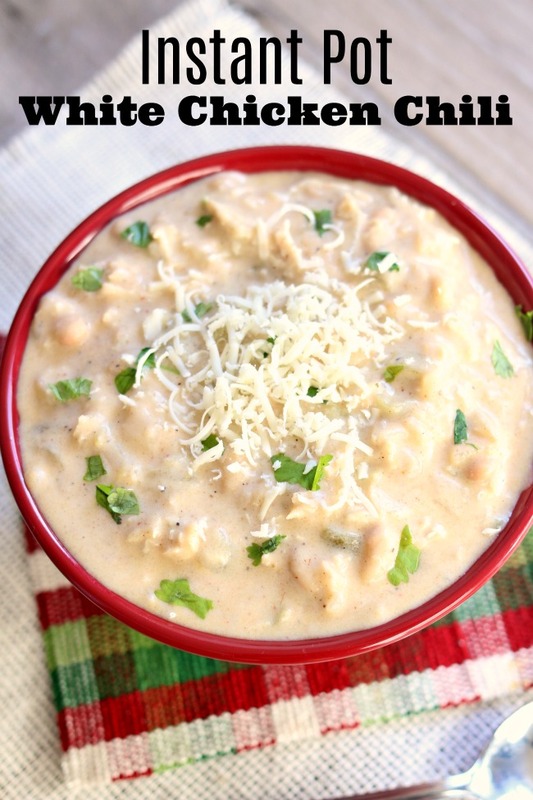 This white chicken chili recipe is a must add to my favorites! Thanks Jennifer! I’m so glad you liked it! Really good, but mine turned out a brownish color… what did i fyi wrong? Hmmm, weird! I have no idea! It’s a good base – but it needs spices for my family’s taste. Am adding cayenne, paprika, some basil and oregano. Also, a jalapeño and green pepper. Our family absolutely loved this recipe! I doubled it but found the consistency was better in using 3 cups of milk instead of four. I also substituted bone broth. It had enough flavor to satisfy Mom and Dad while not being spicy for our kids. Thank you for sharing it! How could I adapt this for cooking on the stovetop? I’m not exactly sure! Try it out and let me know how it turns out. I have the original recipe that I adapted from that is a stovetop version but it uses rotisserie chicken and canned beans would you want that? i would like the original recipe where it was cooked on the stove with rotisserie chicken and canned beans, please. dang! I have been looking and looking and can’t find it. I will keep trying. I don’t know where I put it! How long will this hold on the keep warm setting? If it is helshould the sour cream and milk not be added until just before serving? Probably for a couple hours. You could add it at either time! I have a 8qt pressure cooker. Can I double the recipe. Will it fit? you could probably 1 1/2 times the recipe. Doubling might be too much. This is absolutely delicious. Maybe the best white chili I’ve ever had, let alone made. Fantastic! Wow Susan! I’m so glad you liked it! Delicious! I’m going to try the quick bean soak next time. My canned beans tried to disintegrate – but the flavor is wonderful! Oh really? Sorry about that! Yes I bet dried beans would be better. For anyone trying to make this low fat, I made it with a dry roux and it came out perfectly! My husband who loves his butter not only liked it minus the stick of butter the second time but liked that version better! Just pop the 6 tablespoons of flour in a cast iron or another heat-resistant skillet in the oven at 400 for 40 min to an hour. I do this before I start everything else. Stir it occasionally with a whisk to get even toasting of the flour. Take it out when its about the color of peanut butter. When it comes time to make the roux, just add some hot liquid from the instant pot and whisk to a paste then add back in and continue to stir and let thicken per the normal directions. I followed everything else as written though I do use low fat or fat free milk and sour cream. The dish turns out great and is low in fat and high in lean protein. Thank you so much for that option. I never tried a dry roux, but I will tonight! Do you know if you could toast a larger amount of flour to keep on hand? made this tonight using diced chicken breast. the flavors were good but a little salty for my family’s taste. Will make again but reduce the salt by more than half. Love this recipe! Followed it to the tee and it turned out great! Nice combination of flavors and creaminess. The whole family loved it. The kids were scooping it up with tortilla chips. Will definitely be making it again. It’s one of my kids’ favorites as well! If you use dried beans soaked overnight, would you still double the chicken broth? It seems that the soaking will give you beans similar to canned beans.unless the fact that the canned beans were also cooked loads even more moisture to them. Thanks. yes still double the chicken broth. They will still need liquid to get soft. If you use canned beans should you drain them? 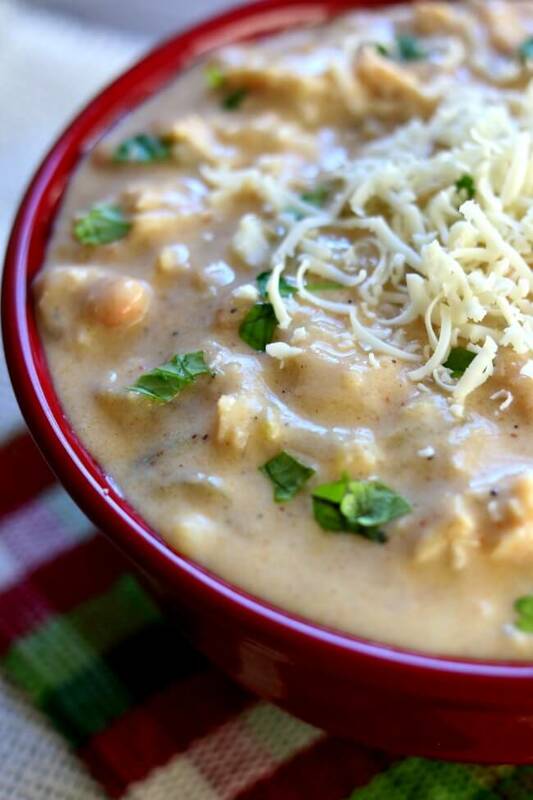 Winner Winner, Creamy White Chicken Chili Dinner! Novice Instant Pot user so love the combination of easy recipe and great taste. Awesome Ken! Thanks so much! I’m glad you liked it. Absolutely divine and easy as well. No leftovers here! Will this fit in a 3 quart instant pot? If not, can you share original recipe quantities so I can make on stovetop? It might be a little bit too full to fit in a 3 quart. You could easily halve the recipe though. Do you know the serving size/nutritional content? This looks amazing but I want to to make sure it fits in my meal plan!! This was so so so good. My family loved it so much. This was my first time using dry beans and they turned out great. I didn’t have sour cream so I used about 2-3 is cream cheese and I also added a can of corn. Such a good recipe. It made so much so I will be sharing with a neighbor! Alicia, I’m so happy you tried it out! I got the idea of this recipe from our family’s white chicken chili recipe. It’s so good! We are vegetarian and new to pressure cooking. Would the cooking time be the same if we did not add the chicken and do you by chance know if adding tofu would work? Recipe looks great! Thanks for any advice. Yes you can cook the same amount of time! I am not familiar with tofu at all so I’m not sure about that. If we halve the recipe, how should cooking times be altered? Keep the time the same! Yum! This was VERY good. Even though I made changes I used your how to and main ingredients. Used 6 chicken thighs ,spices, broth and canned chilis. Added in half a head of cauliflower and pressure cooked 12 min. Perfect! Shredded the chicken, added my white beans ( rather overcooked, that is why I didn’t pressure cooked them again.) and chopped cilantro, a bit of sour cream and some cream ( instead of thickening with butter and flour) The cauli broke down and thickened the chili for me! Soooooo yummy! Thanks for the inspiration! GOOD IDEA! I love the addition of cauliflower! Made this for dinner tonight, exactly as written. I wasn’t too sure about the lime part, but it totally works. It was fantastic. Will definitely make again. Thanks for another winner. Robyn, I’m so glad you tried it! I love the addition of the lime. It just gives a little something extra. it was a little more soupy then I expected but overall very good!!! certainly better and less salt then the canned chili! How spicy would you say this is? My family and I can’t handle anything much more than mild. Thanks! Hi Lissa, it’s really not spicy at all! Just super flavorful! Can you use canned chicken in this recipe?? You suggested adding salt to dry beans when cooking them. I have read not to add salt till they are fully cooked as it toughens them. What is your experience? Nope! That is actually not true. I learned it from America’s Test Kitchen. If you add tomatoes or other highly acidic ingredients they’ll toughen though. Maybe you could halve the recipe as well. I am going to try this without the last few ingredients ( butter-lime). That part of the recipe did not appeal to me. Can this recipe be made gluten-free? I see wheat flour in the ingredients. You could use a gluten free type of flour.